That’s all of us. I was pretty sick all the time and spent a lot of time in bed (although I look pretty fit in this photo). The best way for me to get better was for our family to move to a warmer climate – which we did. This is a photo of me in our front yard in Caringbah, in Sydney, NSW. 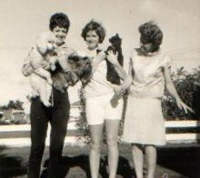 I’m the one of the left holding two dogs. My sister and my mother are with me. We always had dogs and cats and goldfish and just about one of everything else while we were growing up. At this time in my life I was enrolled at Port Hacking High School where I did my Leaving Certificate and went on the work in the taxation office and then an office or two. I wasn’t all that good at office work so I took a job as governess in Wanaaring outside Bourke for twelve months.